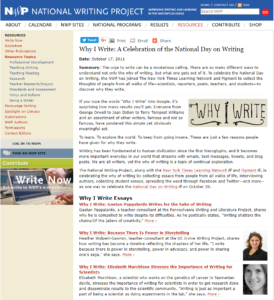 Summary: The “Why I Write” series highlights people who write as professionals across disciplines including science, geology, music, environmental studies and education, among others. This collection includes a few short videos that accompany the articles and is especially useful in connecting writing in school to the real world purposes of writing in various disciplines and occupations. If you type the words “Why I Write” into Google, it’s surprising how many results you’ll get. Everyone from George Orwell to Joan Didion to Terry Tempest Williams and an assortment of other writers, famous and not so famous, have pondered this simple yet obviously meaningful act. To learn. To explore the world. To keep from going insane. These are just a few reasons people have given for why they write. Writing has been fundamental to human civilization since the first hieroglyphs, and it becomes more important everyday in our world that streams with emails, text messages, tweets, and blog posts. We are all writers, yet the why of writing is a topic of continual exploration.